Information a.k.a. "John Anderson's Rally Speedway"
7.20 points at 15 votes (rank 295). 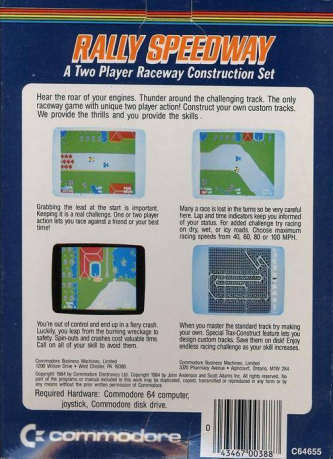 Rally Speedway is a conversion with expansions (improved graphics and track editor) of the racing game with the same name for the Mattel Intellivision console. The physics of driving have been programmed very well for the possibilities at that time and the options for adjusting are diverse. But the special thing in this game is the two-player-mode. 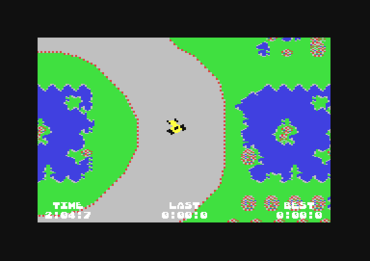 There is no split screen as in Pitstop II, but both racing cars are in the same screen. 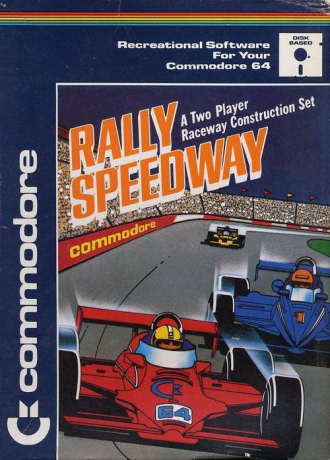 If a car now falls back so far - be it through a crash or slower driving - that the distance between the two racing cars is greater than the size of the screen, the race will be interrupted, the driver who had fallen back will get a penalty, both cars are set up next to each other again and the race is continued at the current points. Another interesting detail is, that you can force each other from the street. If the six tracks built into the game are not enough, one can design some more with the track editor and also save them on disk (24 tracks per disk). Car race from top view (overhead) where the track (and the landscape) are scrolled softly into all direction with different speeds, whereby one gets the impression that the car moves on the track. The graphics are kept relatively simple, but that does not disturb due to the fast movements. The sound is limited to the motor sounds, screaming tires and noises at an accident. The menu options are chosen with / and changed or confirmed with . The car is destroyed when touching rocks, houses and other hard items. / = steer left/right ! !from the driver's view!! / / / = steer left/right ! !from the player's view!! A small tip: It is not an advantage to drive at the front, as in this position you have less time to react on the next bend. So it is better to back off and to try only at the end of the race to take over your opponent. They do not make sense in this game. H.T.W: "Overhead car racing for two players against each other or one player against time (no computer opponent) with many adjustable parameters as acceleration, top speed, road grip, etc. Extremely funny in the two-player-mode with icy, self-created track with much space in the bends and an opponent of about the same strength.". Bamse: "Especially at winter time with a few friends this is great fun to try on icy streets not to fall back. And then the spitefulness when the opponent rolls nicely animated out of his crashed car... If you don't know it: absolutely try it!"